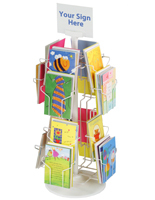 This greeting card rack emphasizes the cards to customers. 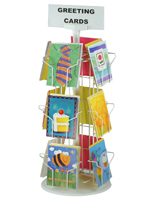 This card stand, a 12 pocket greeting card rack, is offered with a sign holder. The sign holder displays a 1/8" thick message card (supplied by customer). 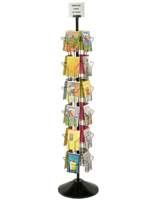 This greeting card rack holds standard 5"w x 7"h cards. 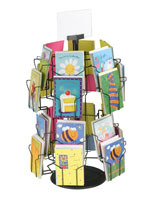 This greeting card rack spins in place, allowing customers to rotate the stand. Placed at the register, this attractive card rack is a great way to promote spontaneous, last minute purchases by customers . 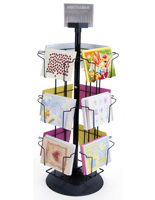 This greeting card rack is made of steel wire with a "gloss black" powder coating. 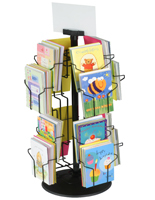 This card holder, greeting card rack has a sturdy black plastic base. This rack assembles in minutes with no tools required. 5.8" x 4.5" x 1.5"
I'm using this to display and sell my homemade greeting cards. It looks professional and is quite sturdy. Thanks so much, Kim! 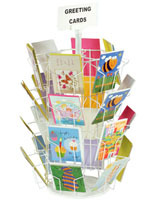 We're so happy to hear that this card rack was perfect for your displaying your homemade greeting cards. If you post a photo on social media, be sure to tag us — we always love seeing our products in-action. Fast delivery, easy to assemble and much sturdier than we anticipated. We are VERY happy with this purchase. Julie, thank you so much for the stellar review! We're so happy to hear that this greeting card rack exceeded your expectations, and we really hope you enjoy it. If you post a photo on social media, be sure to tag us — we always love to see our products in action! Very happy with this purchase - nice, compact and simple assembly. Most impressed with efficiency and fast delivery! Thank you! Thank you so much for the wonderful review, Merle! 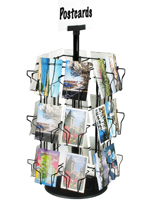 We're glad that you found our greeting card rack to be high-quality and easy to assemble. We hope you'll shop with us again soon! I ordered this card stand and it came shipped beautifully. Was easy to unpack and assemble. Exceeded my expectations. Sturdier than I thought and so nicely made. Really looks nice with my homemade cards in it on display. Spins and works great. Very pleased. Good price and arrived quickly as well. Anyone looking for a card stand should try this one. It won't disappoint. I will definitely shop here again for future needs. Thanks!! So simple and easy and affordable. Sold more cards than ever on the first go with this spinny rack.